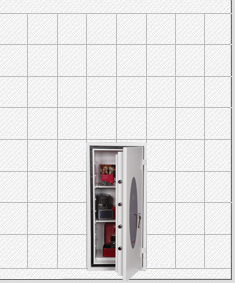 Door includes six 25mm diameter locking bolts. † Add 45mm to external depth for hinges. Construction Double walled steel plate door with an overall thickness of 92mm with a double wall steel plate body providing an overall thickness of 56mm. Phoenix	The Phoenix Citadel SS1193k is designed to conform to the latest and prestigious European S2 Standard and protects against fire and burglary attack. This safe comes with a recommended insurance rating of £4,000 cash or £40,000 valuables and is secured by a high security double bitted (VDS Class 1) key lock supplied with two keys. The Phoenix Citadel SS1193k is tested and approved to protect paper from fire for up to 30 minutes to LFS 30P (EN15659 ECB.S Certified). This model is also available in 2 smaller sizes.